“We started our trip to Magone Division on 15 October 2017 and it ended on 29 October 2017. I am excited to report you about how the Lord of God is moving on unreached peoples’ groups of Burma, Zaw. The trip was blessed with fruit by God. We went to the Magone Division by car. And after that we went by motorcycle and then walked where motorcycles cannot go. We did outreach from village to village and preached the Word of God in house to house and then person to person. 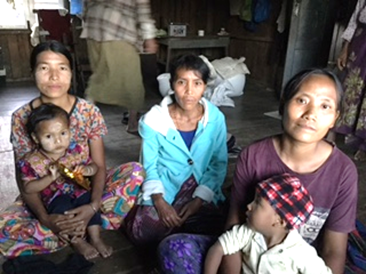 By God’s power, we reached Burmese and Zaw people for the Lord. We were very blessed with the hunger and thirst of these people for the Word of God. We preached the Gospel in Burmese and Zaw villages. We preached the Gospel to 62 Burmese people and 34 people have confessed Jesus as their Savior. We preached the Gospel to 20 Zaw people and 7 people have confessed Jesus as their Savior. Some people got healing by the power of the Holy Ghost. We had reached 3 villages of Burmese [people] and 2 villages of Zaw [people]. Please pray for new believers. They all are from Buddhism. Pray that we have new churches in Magone Division. We need a church planter for this new church in Magone Division. Some religious leaders do not allow us to preach the Gospel where is so great need for the Gospel. They hate Christian missionaries. There is a great opportunity for us to show God’s love and His redemption to His people if we act right now. It is more important than ever that we do everything possible to bless, encourage, and help the unreached people. Together, we can help change that. Your prayer, your gift today will help us increase our efforts to feed hungry people during a great time of need. Your gift of support today for The Word Mission is a vital witness of Christian love to the entire people of Burma and Zaw. May I challenge you today to take part be this opportunity to rise up and share God’s love and God’s redemption with those who are so desperately hurting. Together, we can change lives into joy. The work that we are doing to bless the survivors in Myanmar is a testimony to the entire nation and the word is spreading. With your help, we will be able to do even more to meet these urgent needs and bless unreached people.